Glyphosate’s main aim is to kill. A Glyphosate monograph published by Pesticide Action Network (PAN) highlights its negative impacts. Its residues are so widespread in foods, particularly those containing cereals or GM corn or soy-derived products. Detected in drinking water, wine and beer, and even in non-food products derived from GM cotton, it was also found in human urine in Europe (and Malta), and in the USA, where it was also found in breast milk. Acute symptoms include abdominal pain, gastrointestinal infections, itchy or burning skin, skin infections, blisters, burning or weeping eyes, blurred vision, conjunctivitis, headaches, fever, rapid heartbeat, palpitations, raised blood pressure, dizziness, chest pains, numbness, insomnia, depression, debilitation, difficulty in breathing, respiratory infections, dry cough, sore throat, and unpleasant taste in the mouth. Doctors in Argentina reported vomiting, diarrhoea, respiratory problems and skin rashes in association with aerial spraying of glyphosate. Other effects include balance disorder, reduced cognitive capacity, seizures, impaired vision, smell, hearing and taste, drop in blood pressure, twitches and tics, muscle paralysis, peripheral neuropathy, loss of gross and fine motor skills, excessive sweating, and severe fatigue. Exposure to glyphosate-based herbicides, even at very low doses, may result in reproductive problems including miscarriages, pre-term deliveries, low birth weights, and birth defects. Other adverse effects are in sexual and other cell differentiation, bone metabolism, liver metabolism, reproduction, development and behaviour, and hormone-dependent diseases such as breast and prostate cancer (Gasnier et al. 2009). Laboratory studies show that very low levels of glyphosate, Roundup, POEA, and the metabolite AMPA all kill human umbilical, embryonic and placental cells. Roundup can kill testicular cells, reduce sperm numbers, increase abnormal sperm, and retard skeletal development. Kidney and liver are the main target organs for glyphosate, as reported from laboratory studies, including cell damage and death, DNA damage and tumours. It is regarded as a Highly Hazardous Pesticide as defined by PAN (PAN International 2016b) and by FAO/WHO Joint Meeting on Pesticide Management as implemented by FAO in Mozambique (Come et al. 2013). Emerging evidence shows that glyphosate can affect brain areas associated with Parkinson’s disease. Its exposure is also related with parkinsonian, Attention-Deficit/ Hyperactivity Disorder (ADHD) and autism. Several studies indicate that glyphosate formulations may interfere with the immune system resulting in adverse respiratory effects including asthma, rheumatoid arthritis, and autoimmune skin and mucous membrane effects. Glyphosate has direct and indirect eco-toxicological effects especially the unprecedented elimination of flora termed weeds, which are essential to most beneficial species. Direct and indirect effects have cascading impacts on the food chain and on biodiversity. Earthworms and a number of beneficial insects useful in biological control, particularly predatory mites, carabid beetles, ladybirds, and green lacewings all are negatively effected by glyphosate. At levels commonly found in agricultural settings, it impairs honeybees’ cognitive capacities affecting their navigation with potential long-term negative consequences for colony foraging success. Its subtle effects cause disruption of the ecosystem that are of greatest concern, particularly effects on the agroecosystem. The Minister for the Environment was quoted (January 2017) saying that “the government would continue to oppose glyphosate in EU discussions, but could not implement a unilateral ban due to European single market rules.” Malta’s voting on related matters at EU discussions are all abstentions. 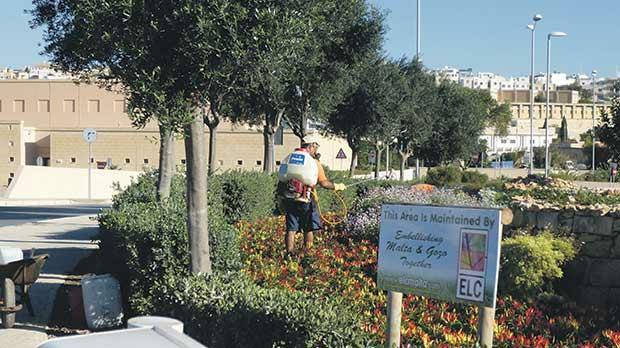 The placing on the market of glyphosate is role of the minister responsible for the Malta Competition and Consumer Affairs Authority (MCCAA) – the regulator. The environmental health impacts of glyphosate is the responsibility of the Minister for Health. Herrera is only the operator. His main responsibility is the protection of biodiversity, as explained above. Herrera’s ERA should be in the front line on preventing glyphosate impacts on biodiversity to prevent biodiversity loss. ERA is also the Competent Authority for the EU Water Framework Directive, thus responsible for the vulnerable areas of Malta’s groundwater. ERA should advice the Minster on Malta’s international responsibilities. It is not right that Herrera is left alone without any help from other authorities involved. Unless of course he has direction to walk it alone. “We believe that Malta should be in the front line on environmental standards. Not because of obligation of any EU Directive, but because this is what our children deserve” (p 92). Unless of course Herr-ERA and co believe that these are now past their best by date. What a high price we are paying for such ‘cheap food’.